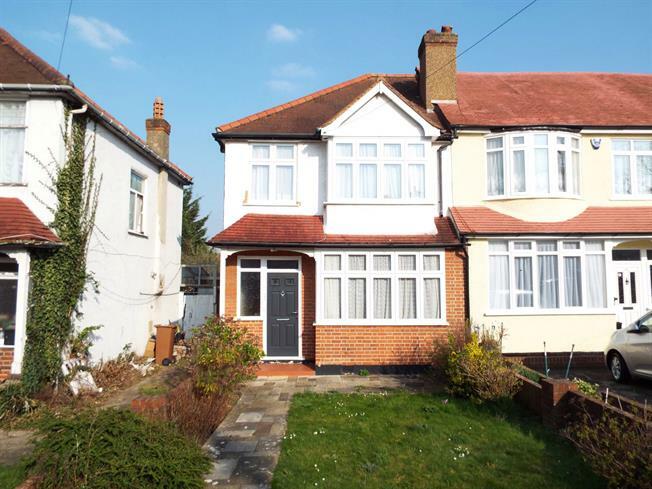 3 Bedroom End of Terrace House For Sale in Worcester Park for Guide Price £475,000. GUIDE PRICE 475,000 to 500,000 NO FORWARD CHAIN. A well presented, three bedroom, end of terrace house. This lovely home has two separate reception rooms on the ground floor with a lounge to the front and a dining room with double doors onto a patio area. The first floor provides two double bedrooms and a larger than usual third bedroom as well as a family bathroom. The pretty rear garden has side access, a garage to the rear and offer scope to extend subject to the usual planning consents. Stoneleigh Avenue is well located for access to the shops, bars and restaurants of Central Road and Worcester Park station with its regular service to London Waterloo in under thirty minutes. The open spaces of Cuddington Recreation Ground can be found nearby making this a great family orientated location with a number of well regarded schools locally. As you would expect from a busy and vibrant high street there are plenty of well know stores and restaurants including Waitrose, Sainsbury's Local and Pizza Express. The A3 provides access to London and the south of England by car and buses serve both Sutton and Kingston.